GlassesUSA.com and Cardinal Health, Inc. launched a partnership recently aimed at promoting an affordable and practical option in vision care. The partnership, in which Cardinal.com will promote GlassesUSA’s products and service for prescription eyeglasses and sunglasses at severely discounted prices is geared towards making the purchase of quality eyeglasses less expensive. GlassesUSA.com, a New Jersey-based company, specializes in selling high-quality prescription glasses online at affordable prices with worldwide shipping options. GlassesUSA provides affordable eyewear to millions of people worldwide who cannot afford the high-price of glasses offered at many offline retail locations.Many of the eyeglasses sold at GlassesUSA.com are priced at 75% lower than the cost of traditional eyewear. Team LASIK-FOR-THE-GOLD, is a collection of champion Olympic athletes from across the country who have all had LASIK vision correction surgery by Cary M. Silverman, M.D., Medical Director of EyeCare 20/20. Katherine Reutter (short track speedskating) – Reutter is now a 17-time world cup medalist who is locked-n-loaded for her Olympic debut. She will compete in four different events and is considered to be one of Team USA’s most likely Olympic medalists. Chad Hedrick (speedskating) – Already a gold, silver and bronze medalist from the 2006 Olympics in Torino, Hedrick has recently returned to his championship form and earned medals in both of his last two world cup events, including a gold medal in Calgary, Canada in December. Hedrick will square off against fellow American Shani Davis in the 1500 meters at this year’s Games in what promises to be one of the must-see showdown events of the 2010 Winter Olympics. Curt Tomasevicz (bobsled) – A pusher behind U.S. driver Steve Holcomb in Team U.S.A.’s number one sled the ‘Night Train’, Tomasevicz and his teammates are on the podium more often than they are off of it. They are considered the team to beat when the Olympic medals are on the line next month. Eric Pac (bobsled) – Long since considered ‘likely to make the Olympic Team’, Pac has recently shown that simply getting to the Olympics isn’t good enough. A world cup bronze medal in Salt Lake City in November turned heads on the international bobsled circuit and marked Pac as someone to keep an eye on in Vancouver. She currently holds a 5th place ranking in the overall World Cup standings. Molly Engstrom (hockey) – A bronze medalist at the 2006 Olympics, a World Champion, and a long time member of the U.S. National Team, Engstrom and her teammates are highly likely to do battle with the host Canadian team with gold medals on the line. In this heated international rivalry, silver doesn’t count. About Cary M. Silverman, M.D. and EyeCare 20/20: Located in East Hanover, NJ, EyeCare 20/20 provides ophthalmic care for the entire family whether it’s routine vision correction or surgical intervention. Under the direction of Cary Silverman, M.D., Medical Director, they serve patients from surrounding communities as well as those from other states nationwide. Their beautifully decorated, modern facility gives patients a comfortable, yet most efficient environment in which to receive treatment. Dr. Silverman specializes in innovative LASIK vision correction, state-of-the-art refractive cataract surgery, as well as an array of other refractive surgery options for patients who are not candidates for LASIK. For more information, visit: www.eyecare2020.com. GlassesUSA is keeping prescription eyeglasses affordable. Staying in line with their philosophy of ensuring eyeglasses are an affordable necessity and not an expensive luxury, GlassesUSA recently launched a new marketing campaign for their customers. The newest campaign is aimed at selling a selected portion of their most popular, fashionable eyeglass frames at a discount to their customers. Unlike many retailers who keep their sales under wraps and hidden in the dark corners of their websites with special landing pages in hopes that customers will not use the discount, GlassesUSA launched their “Autumn Sale 2009” campaign first via email to customers who signed up for their seasonal newsletter. After the successful email campaign was launched, GlassesUSA launched the promotion on their website – inviting customers to take 10% off any of the selected eyeglasses. The final steps in the promotional campaign launch was reaching out to bloggers and affiliates in order to get the word out about the 10% discount. The campaign was well-received among bloggers and those running coupon and discount sites. GlassesUSA, a company that endured many changes recently including moving their shipping outfit to St. Joseph, Michigan, is an international cooperative group with offices in New Jersey as well as Tel Aviv, Israel. The company believes that vision care should be within arms reach and that high-quality eyeglasses should not cost a fortune. In conjunction with their business philosophy, GlassesUSA established efforts for their customers to not only recycle broken glasses but to donate old and used eyeglasses in order to ensure that those around the globe who cannot afford eyeglasses will receive them free of cost. Since launching as a company, GlassesUSA transformed into an organization committed to philanthropy as well as consumer education. Their customers have a blog available to find the best ways to keep themselves informed on anything new in the vision world. GlassesUSA also reaches out to its customers with creative and innovative ways to save money – such as their Autumn Sale 2009. Barack Obama, President of the United States of America proclaims March 1 through March 7, 2009, as Save Your Vision Week. BiCOM Inc home of Glaucoma Eye Test Diaton – non-contact Glaucoma Eye Test through the Eyelid is prepared to assist with vision screenings. Roman Iospa, CEO of BiCOM comments on Presidents support of glaucoma screenings. Early diagnosis and timely treatment are critical to minimize vision loss from eye diseases. Proclamation by the president of the United Stated of America addresses the important issue of Blindness and visual impairment that affects millions of Americans. Early diagnosis and timely treatment are critical to minimize vision loss from eye diseases. During Save Your Vision Week – Barack Obama encourages all Americans to take action to prevent their vision loss. 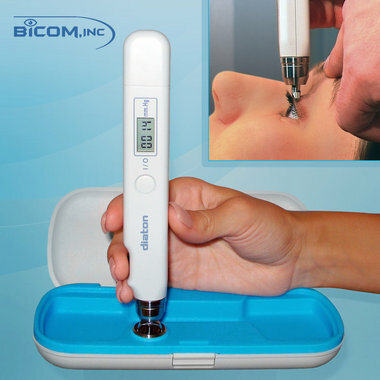 BiCOM Inc. home of Glaucoma Eye Test Diaton Tonometer (IOP through the Eyelid), has been a long supporter of preventive glaucoma screenings. At a recent free glaucoma screening event where BiCOM in conjunction with SAVE Program (Sight for a Vision Exchange) and The Congressional Glaucoma Caucus Foundation conducted at New York City Children’s Services in honor of African American Heritage Celebration has revealed many with elevated intraocular pressure (IOP) a major risk factor for glaucoma. Patients were referred to an ophthalmologist Dr. Lynnette P. Williams-Young a glaucoma specialist for further evaluation. Unfortunately, most people have limited knowledge of blinding eye disorders. Based on National Eye Institute 2005 study, only eight percent of respondents knew that glaucoma, a condition that can damage the optic nerve and cause vision loss and blindness, strikes without early warning. Similarly, glaucoma also begins as a silent vision threat; as per Prevent Blindness America, it is estimated that of those Americans that have glaucoma, only half know they have it. It is estimated that 60 million Americans are at risk for developing glaucoma. Everyone should be screened, especially with availability of new non-invasive (over the eyelid) glaucoma screening technology aka “Glaucoma Eye Test” Diaton tonometer available to optometrists, ophthalmologists and general physicians, enabling doctors to quickly and painlessly screen individuals at risk. Several demographic groups are at higher risk for visual impairment, including teenagers, diabetics, Hispanics, African Americans, and the economically disadvantaged. Older Americans are more susceptible to eye conditions such as age-related macular degeneration, diabetic retinopathy, and glaucoma. Children need regular vision screenings because vision disorders left untreated during childhood can lead to permanent visual impairment during adulthood. “I’m pleased to see that President Barack Obama, with only weeks in the office is addressing an important issue of blindness, its early detection and timely treatment. My whole team at BiCOM Inc., and our partners are ready to continue our efforts and act on a larger scale by reaching out to many more people through awareness, training, glaucoma screening events and making “Glaucoma Eye Test” Diaton tonometer available to all that are willing to participate,“ said Roman Iospa, CEO of BiCOM Inc.
BiCOM represents and supports Glaucoma Eye Test aka Diaton tonometers in over 50 countries and growing. BiCOM conducts Free Glaucoma Screening Events throughout the Globe. GlassesUSA announced a partnership with the Lions Club this week. The partnership will consist of taking used eyeglasses and returned prescription eyeglasses and donating them to the Uniontown Lions Club. The partnership is a new development for GlassesUSA as it hopes to change the way people view eyecare and eyeglasses. Vision care has long been a luxury in the United States as opposed to a necessity. Lions Clubs all over the United States have taken to the streets to find old and used eyeglasses in order to produce a wearable eyeglass frame with new lenses. The new eyeglasses are then given to those who need them most – people who cannot afford eyeglasses. GlassesUSA is proud to be a part of such a union. Eyeglasses returned by customers will be sent to the Uniontown Lions Club for collection. The glasses will then be recycled and sent to a re-manufacturing plant. From there, new lenses are manufactured suited to fit the needs of the future wearer. The eyeglasses are then sent to the people who need them the most. Once customers have sent their glasses in along with their email address, a receipt will be given to them via email. In order to receive the discount, the customer must email the receipt to support@glassesusa.com to receive the coupon code. For additional information, contact Hillary or visit GlassesUSA.com.